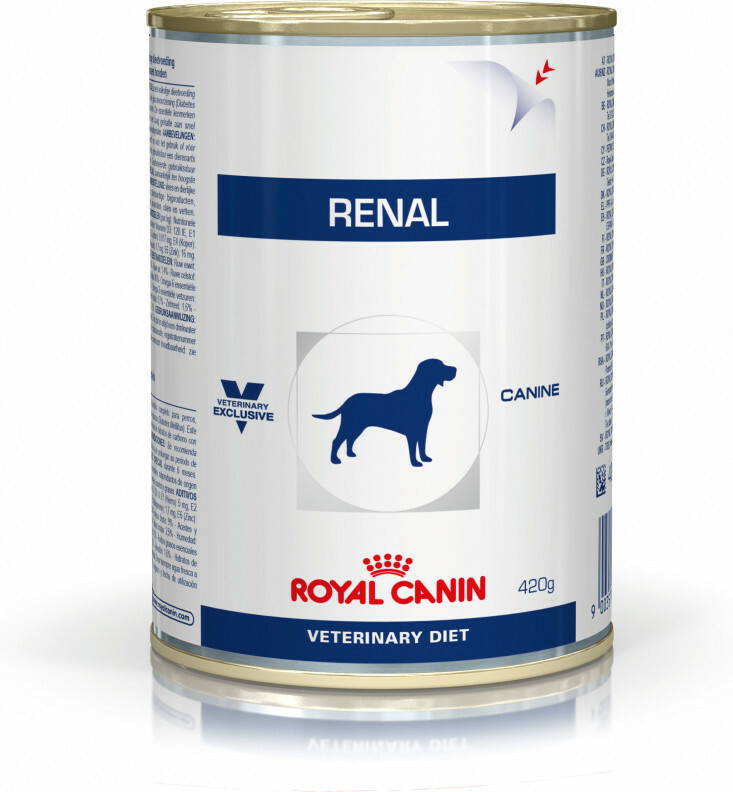 Renal (can) For dogs with Chronic kidney disease (CKD). 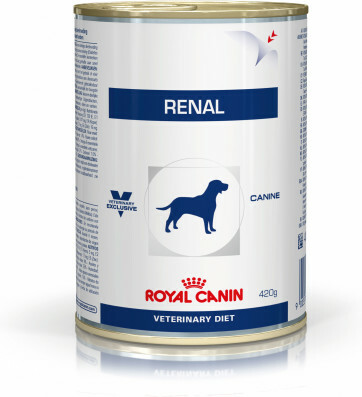 Formulated to support renal function in dogs with chronic kidney disease. 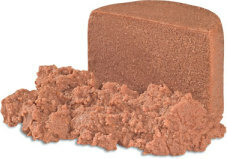 Contains EPA and DHA, a complex of antioxidants and a low phosphorus level. Inadequate renal workload may induce ureamic crisis. An adapted content of high quality protein helps reduce renal workload. Chronic kidney disease can lead to metabolic acidosis. Formulated with alkalinizing agents. A specific aromatic profile allows for differences in individual preference, because dogs with CKD are more likely to develop inappetance or food aversion. Rice, pork meats, chicken meats, sunflower oil, corn flour, minerals (including Calcium carbonate, Potassium citrate, zeolite), cellulose, fish oil, cassia gum, sugar beet pulp, carrageenan, taurine, fructo-oligosaccharides (FOS), marigold meal (rich in lutein), methionine, trace elements (including chelated trace elements), vitamins. Crude ash: 1.3%. Crude fibre: 1.2%. Crude oil fats: 9%. Moisture: 66%. Protein: 5.4%. Vitamin D3: 250IU, E1 (Iron): 14mg, E2 (Iodine): 0,53mg, E4 (Copper): 4,2mg, E5 (Manganese): 4,3mg, E6 (Zinc): 43mg.